My ladder flower stand. An old handmade ladder got a white paint makeover and is now the perfect spot to showcase my newest garden flowers. Good morning, ladies of the nest. Welcome back to another episode of decorating the deck (see this years first episode of decorating the deck here) . Spring is still making us feel that summer is a long way off with cold nights and cloudy days. I decided however to not let that deter me from playing around outside and making our roofed terrace a nice place to hang out. And so we did. We’ve had the grill going already and we dined al fresco several times (even if I did put on the heater and wrapped my legs in a blanket). I have also been planting. A bit early actually, I kept getting warnings from the weather channel that the nights are still very cold (almost freezing still), but I went for it anyway. So far so good, I haven’t lost a plant yet. Me and fresh blooming flowers, a dangerous combination…. What is it by the way with the addictive power of garden centers? You go in there to buy a new attachment for the garden hose and you come out with an overflowing cart of perennials (even after I decided to be frugal and not waste too much money on perennials this year). Oh the lure of all those flowers blooming in all those pretty colors. The colorful arrangements that look so good in this years hottest containers. The rows and rows of blooms begging you to take them with you. I am such a sucker….. I came back with lots of flowers. And in my defense I have been enjoying them immensely. So I guess that makes it okay, doesn’t it? I don’t know why or how it happened but I somehow ended up with several varieties of petunia. I love that plant. The soft petals are so sweet and when you keep picking out the old flowers, it just keeps blooming and blooming all summer. I kind of hate though that it is so sticky. Picking out the wilted flowers is a bit of a messy job, but I guess like always, beauty has a price. My collection of pink flowers were given a very special place to do their thing. I dug up a little step ladder from the basement, painted it white and it is now a perfect flower stand. The step ladder has a sentimental meaning. The man made it. In school when he was about 14 years old. As most very young boys he did not have a clue where to go in live or what to do and where to go to for his education after primary school. His father had learned his trade ‘at the job’ from the age of 12, so he decided for him and send him to technical school to ‘learn a proper skill’. Wood working became the training of choice. So in fact I have a bona fide carpenter at home…..
Not that you’d know it if you came over, since he kind of hates DIY projects with a vengeance and I have not seen him ‘built’ anything in all the years we are together. But one time in is his life, before events and interests took him in a totally different direction, he worked with his hands and created ‘stuff’ from nothing. Like this little ladder flower stand (and a lovely little sawhorse bench that I gave a makeover years ago). He said he would have thrown the ladder out, it didn’t have any meaning to him. But I know that he is secretly proud of this project and that he loves that it is showing off itself on our terrace now. The step ladder used to be just plain wood. I hunted high and low through my extensive photo archives for a ‘before’ photo, but as it turned out I never photographed the ladder in its original state. But heck just imagine it light brown and you are good to go. Ah that waterfall of miniature flowers in an old soup terrine, gotta love it. So there you have it. Another little project done, involving white paint and flowers and with sweet memories surrounding it to boot. It makes this ladder flower stand among the best of the best of projects in my book. What a cute idea! I love what you have done with the step ladder. Your flowers are beautiful! Just lovely, Marianne! 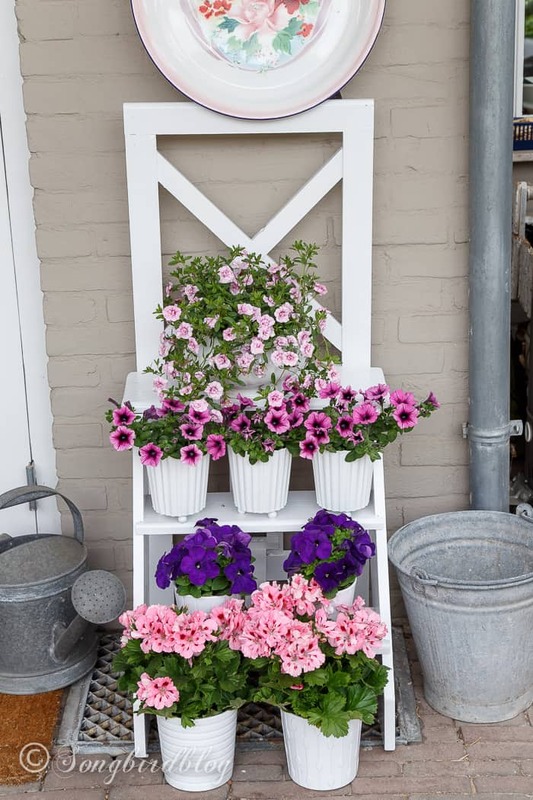 I love the sweet little ladder and all of your pretty white containers that showcase your flowers so beautifully as well. This is so lovely! This would look amazing on my patio! I wonder if I can convince my husband to make this up for me?? Cute! I want my husband to make one for our front porch.